Matching Lobby Sign, Window and Wall Graphics! Door Systems is in the business of installing, retrofitting, maintaining and selling doors and door products. Whether you are looking to buy rolling steel doors, fire doors or residential garage doors, this company has just what you are looking for. 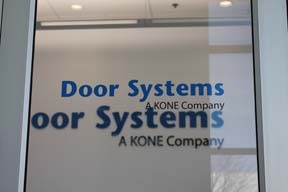 Located at 2019 Corporate Lane in Naperville, Door Systems has been in business since 1954 and built a loyal following of enthusiastic customers. Yet even a successful business needs great signage. When it came time to add new signs to its property, the company contacted Mark Your Space. The goal? Help them boost their brand with matching lobby sign, window and wall graphics! 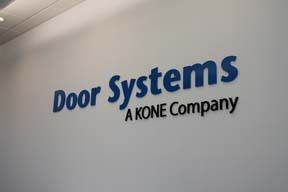 First, we visited with the management of Door Systems. Next, We designed, manufactured and installed three dimensional letter signs for the lobby, training room and warehouse. We added window door graphics and wall graphics! The finished result is a mix of artistic expression and successful branding. 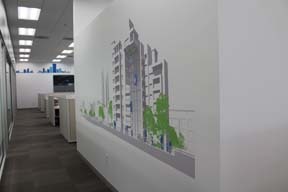 Digitally printed frosted vinyl offers conference room users a bit of privacy and makes the glass panes take on an air of separation. It eliminates the sometimes unfortunate look of wide open space inside an office. The digitally printed wall murals looks great and adds definition to a wall that would have been difficult to decorate with frames. Are you thinking of adding window graphics for Naperville, IL, business properties? We can help. The advantages are plentiful. Beautify the space. Window graphics have the power to turn an otherwise bland storefront into a welcoming space that sets the tone for the customer’s experience inside. Market! Your logo and company name feature front and center with some graphics we can put on your panes. Help with the creation of name recognition and support your branding effort. Highlight products. This is particularly important if you are a service provider or sell high-end products. Large images of your products can create a need in the customer’s mind that your store or office is then ready to fulfill. Around tax time, a large picture featuring a calculator, a frustrated tax payer and a tax form remind consumers that it is time to pay up. When they need help with tax preparation, they remember the window graphic. When you choose dimensional letter signs in Naperville, IL, you make a great first impression. The shape of the lettering stands out and captures the attention of anyone walking or driving past the venue. Since so many markers do not use this technology, yours is sure to stand out. We like to use dimensional letters on the façade whenever possible. You have plenty of material options in keeping with your company’s overall image. There are aluminum, wood and acrylic letters. You might even choose to install a similar marker as a lobby sign on the inside. This is a great way of transitioning from exterior to interior signage. It assists with branding, name recognition and sets the tone for the mood inside your business property. By the way, did you know that with the right lighting, you can create amazing plays of light and shadow after dark? When you work with these letters on the inside, you might even dedicate a wall to their display since you can turn the sign into attractive artwork. Want to dress up your business interiors? Click below to request a free quote!